My husband and I, along with our little boy visited this pub tonight for a drink after work. I was interested to visit as it is down the road from us and has recently undergone a refurb. And what a refurb it is, just stunning a great place to be in. I had previously been to this pub under the old management and found it dark and dingey but now it's light and bright and has some lovely features. While some areas like the toilets need some finishing touches, the main bar areas are great and they have extended the enclosed beer garden which is safe and has great new round benches. The new owners have only been open 2 weeks and in sure this pub will go from strength to strength! We will definitely be visiting again! I have been to this pub on occassions [while ago now though] , The Land Lady appears friendly enough, Beer not the cheapest in Town, Pool Table, Snacks etc are availiable. Some characters go there, all seems ok.......! BUT.... i discovered that one of the Regular Drinkers actually steals customers belongings from the bar area. Put me off a little bit, I,m not sure if the Staff are aware of this. Great Pub situated outside the town centre. Mainly used by locals, but visitors always made to feel welcome. Real ales kept to a very good standard (a rare thing in Leighton Buzzard) and a guest ale is usually available. The pub is well run, and there is very rarely any trouble. Pool teams, darts teams and the usual quiz night and accoustic night. Well worth visiting. This is a badly underrated pub! Yes, its a proper location for locals to chill out, either after a long day at work for a quick refresher or an evenings entertainment. Anyone who turns up is welcome in the relaxed atmosphere with unintrusive interset to their well being. The quize once a fortnight ((thurs) is great fun and the monthly 'acoustic' night (fri) a real treat with an eglatic renditions of tunes/songs and recitations. A proper place to join in and have fun, interesting conversation or just a quiet pint! 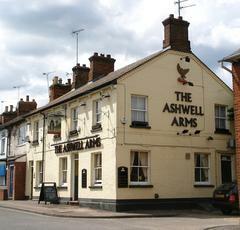 IN REPLY TO THE COMMENTS RECENTLY ADDED TO THE ASHWELL ARMS. THE PERSON HAS OBVIOUSLY GOT HIS PUBS MIXED UP. IT IS A FRIENDLY LOCAL BACK STREET PUB. WHICH I AM PROUD TO BE LANDLADY OF. A RELAXED FUN ATMOSPERE CHILDREN ARE WELCOME. AS FOR THE COMMENTS ON MY FOOD.IM SURE WALKERS CRISPS AND NOBBYS NUTS WOULD BE INTRESTED IN YOUR COMMENTS. AS I DO NOT SERVE FOOD AND HAVANT SINCE IVE BEEN HERE NEARLY 4 YEARS. REVIEWS ARE FINE IF THE INFORMATION IS CORRECT IF IT ISNT THIS CAN BE DAMAGING TO MY BUSINESS. I SUGGEST THAT THE PERSON THAT WROTE THE RECENT REVIEW RETURNS TO THE ASHWELL FOR ANOTHER LOOK AROUND THEN MAYBE HE WILL REALISE HES GOT HIS PUBS MIXED UP. ANYONE ELSE COME SEE FOR YOURSELF. JUST FOR THE RECORD MY DOG IS T TOTAL AND HAS NEVER LICKED OR DRANK FROM MY BEER PUMPS. ANOTHER MISS INFORMANT.